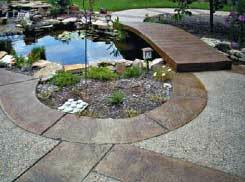 At first glance, this project is simply a stamped and washed finish patio – but the real feature is the foot bridge spanning the koi pond. not wanting to introduce any wood structures to their low maintenance project, the homeowners embraced Baltz and Sons Concrete’s concept of installing a concrete footbridge, one that would mimic a wooden bridge. Baltz and Sons Concrete built a form for the bridge off-site, while the first phases of installing a washed limestone hybrid mix patio, with southwest slate perimeter and cross-bands was started. afterwards, the bridge-form was placed, secured and then poured in place, using Buckeye uf500 reinforced, #4,000 psi concrete supplied by memphis ready mix. the surface was then stamped using a boardwalk texture. after ample curing, the forms were removed, followed by intricate grinding and touch up. finally, acid stains and topical pigments helped to complete the illusion. this project has garnered national acclaim on the Concrete network as an example of how concrete can replace wood as a building medium.